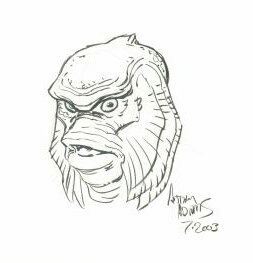 Nice head shot sketch of the Creature from the Black Lagoon from comic art fan favorite Arthur Adams. Unlike his other sketches, Art used heavier pens on this piece to give a different feel. This sketch was picked up from Art during the San Diego Comic Convention in 2003. It is drawn on 11 x 14 Acid Free Bristol where the image is approx 7 x 5.5.